The names will be forwarded to Seattle Mayor Jenny Durkan, who will interview the candidates and make her selection by late June or early July. Her choice will be submitted to the City Council for a confirmation vote. After a nationwide search, three people from outside the Seattle Police Department were named as finalists Friday to become its next police chief. 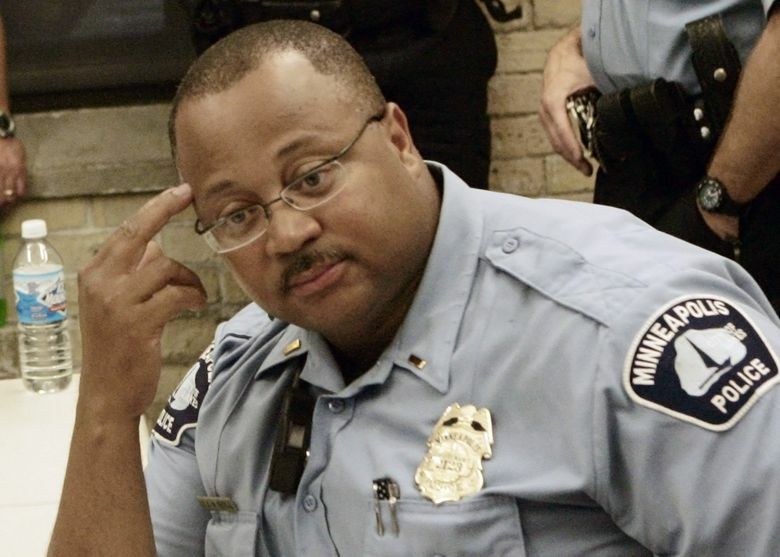 They are former Pittsburgh police chief Cameron McLay, who is the only finalist to have served as the chief of a large city police department; Ely Reyes, assistant chief in the Austin Police Department in Texas; and Eddie Frizell, an inspector and former deputy chief of patrol in the Minneapolis Police Department. The finalists were announced during a City Hall news conference in which city and civic leaders who conducted the search stressed the need to bring in an outsider to carry on the reform work of the previous chief, Kathleen O’Toole, who also came from outside the department. Their names were forwarded to Mayor Jenny Durkan, who did not attend the news conference. She will interview the finalists, examine the results of visits her representatives will make to the cities where finalists have worked and announce her selection by late June or early July. Her choice will be submitted to the City Council for a confirmation vote. The three finalists, all touted as outstanding leaders, were selected from a group of five semifinalists submitted by a search committee appointed by Durkan earlier this year. McLay, Frizell and Reyes were ranked as the top three by the committee, according to two sources familiar with the search process. With input from the search committee’s four co-chairs, an internal group in the mayor’s office selected the finalists. The other two semifinalists were Carmen Best, who has served as Seattle’s interim police chief since Jan. 1 after O’Toole stepped down as chief at the end of last year; and Jorge Villegas, an assistant chief in the Los Angeles Police Department. Best’s absence as a finalist drew sharp criticism from some community leaders who said that Best, as an African-American woman, was being treated unfairly after playing a key role as a deputy chief in navigating the department through federally mandated reforms. She announced her candidacy in December after O’Toole disclosed her plans to leave. Known for her outgoing personality, she has enjoyed widespread support in the department and the community. Best, a 26-year veteran of the department, issued a statement thanking Durkan for giving her the opportunity to serve as interim chief and agreed to stay on until a new chief is confirmed. “I wish the candidates the best — each of them should know how fortunate they will be to lead officers who have a commitment to public safety and reform,” her statement said. Durkan’s selection will be one of the most important personnel decisions she makes. In January, the department entered into a two-year period in which it must show that reforms to address excessive force and biased policing, enacted under a 2012 consent decree with the U.S. Justice Department, are locked in place. After a federal judge found the department in compliance with the consent decree in January, Durkan said “the next two years are going to be critical” to continuing the work. The city’s work is not done — “and we know we’re not done,” she said. “Our next chief of police will shoulder the incredible responsibility of protecting all Seattle communities and building trust among those who have the greatest distrust of police and the criminal justice system, and who face the bias and institutional racism of our current system,” Colleen Echohawk, one of search committee’s co-chairs and executive director of the Chief Seattle Club, said during the news conference. McLay, a reformer who clashed with Pittsburgh’s police union, served for two years in the Pittsburgh department before resigning in November 2016, saying he had accomplished everything he believed he could, the Pittsburgh Post-Gazette reported at the time. Previously, he served as a leadership development consultant for the International Association of Chiefs of Police and was a longtime police officer in Madison, Wisconsin, where he rose to the rank of captain, according to the Post-Gazette. Reyes, an Army veteran, began his law-enforcement career with the Austin Police Department in 1996 and is currently the assistant chief overseeing the North Patrol Bureau and the Communications Center, according to his LinkedIn page. “Chief Reyes believes strongly in continuing education and has earned both his bachelor and master’s degrees from Texas State University while working full time as a police officer and raising a family,” his biography says. Frizell, in his inspector role, oversees operations in downtown Minneapolis, according to news reports. As a deputy chief, he ran patrol operations in the department, which included five precinct commands, as well as the department’s Special Operations Division that includes SWAT, mounted patrol and the bomb/arson unit, according to his LinkedIn page and news reports. He also holds the rank of colonel in the Minnesota Army National Guard, for which he has served for 28 years, including a deployment to Iraq. Tim Burgess, a search-commitee chair who was a longtime Seattle City Council member and interim mayor, said in some respects the needs of the department for an outsider worked against Best. Responding to a reporter’s question about not selecting a woman of color, Burgess noted two of the three finalists — Reyes and Frizell — are people of color. The five semifinalists were submitted to the mayor’s office earlier this week by the search committee, which included 25 members in addition to the chairs. The five were among six candidates the committee interviewed last week after receiving about 60 applications. That list was initially narrowed to 10 candidates. This week, the semifinalists were asked to answer written questions as part of a comprehensive examination process, required under the city charter, that included work done by the search committee and input from the search-committee chairs. The answers were evaluated by a group of assessors assembled by Durkan: former King County Executive Ron Sims; Senior Deputy Mayor Michael Fong; the mayor’s legal counsel, Ian Warner; Deputy Mayor Shefali Ranganathan; and Barney Melekian, the mayor’s public safety adviser. The Rev. Harriett Walden, a longtime African-American leader in Seattle, attended the news conference, where she softly made critical comments. “This was flawed. They did everything they could to eliminate Carmen,” said Walden, who said she was speaking as a founding member of Mothers for Police Accountability. “And they didn’t mention anything about the consent decree. 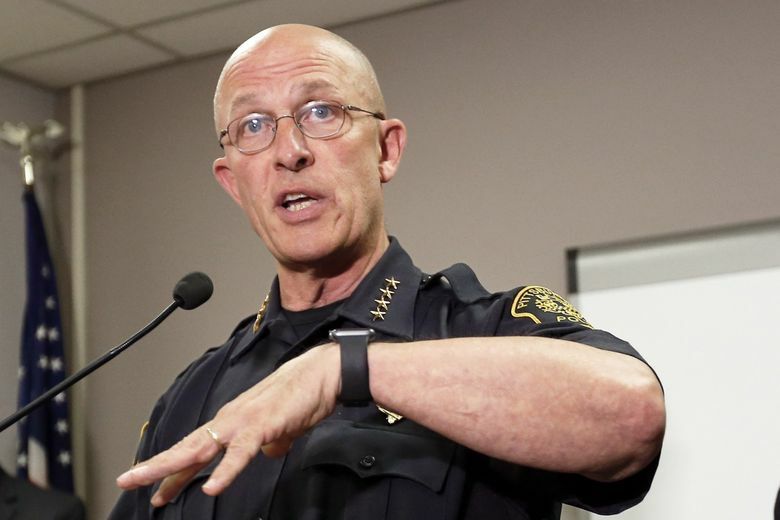 She’s been working on through the consent decree, but we know it’s anything but the black woman,” said Walden, who serves as a co-chair of Seattle Community Police Commission. He said after the committee finished its work, the five semifinalists entered into a “secretive process” that involved people whose role was unknown.